The Annual East Coast Shag Classic features dance performances, lessons, open dancing, a silent auction and live music by Band of Oz, Jim Quick & Coastline Band, Gary Louder & Smokin’ Hot, and the Entertainers. Proceeds benefit Hope Abounds. 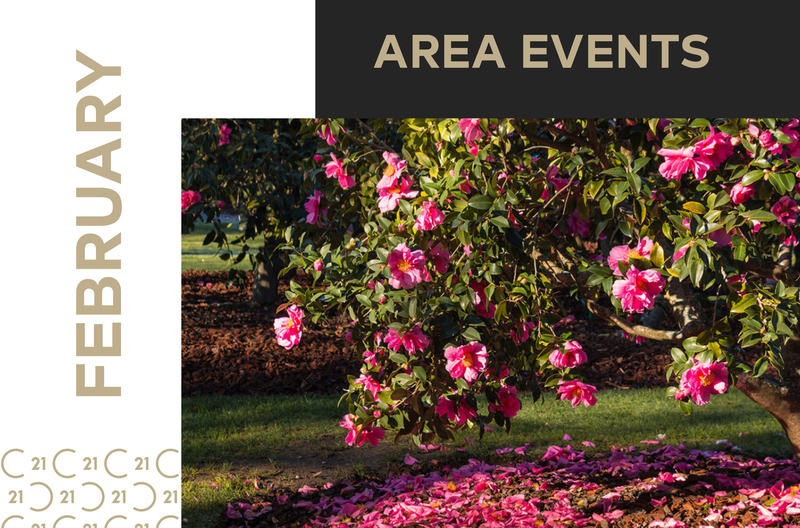 The Annual Spring Show & Sale features flower exhibitors from all over the Southeastern U.S. Camellia experts display more than 500 blooms representing many varieties for evaluation by American Camellia Society judges. Highlights include Camellia care education and an interactive children’s corner. The town of Holden Beach will celebrate its 50th Anniversary and create a time capsule. Cake and ice cream will be served. There will be a dinner to commemorate Holden Beach’s history followed by a bonfire on the beach. Southport’s Franklin Square Gallery will host it’s annual Spring Art Show to introduce the latest paintings, pottery and sculptures by both gallery members and guest artists from throughout southeastern North Carolina. Join the Topsail Chamber of Commerce for dinner, drinks and dancing. Games include Craps, Roulette and Blackjack with a reverse raffle and there will be a live DJ. Proceeds benefit the Chamber’s mission for economic growth and civic well-being. Celebrate what is considered to be one of the first Patriot victories of the American Revolution and see history come to life. Visitors will be treated to stories and demonstrations of 18th century military and colonial life. Enjoy a night of dinner, dancing, auctions, raffles and entertainment while supporting cancer patients in the community. Includes fashion show and performances. Onslow Pines Park Classroom Parents enjoy an evening out to celebrate an early Valentine’s Day while the kids have a fun filled night of Valentine themed activities, games, and snacks. Pre-registration is required. items range from fine jewelry and antique clothing to vintage to vintage toys and military items. Everything must be at least 50 years old so products range from the 1700s to the 1960s. Enjoy tastings, demonstrations, bake-offs, golfing and relaxing at the spa. Proceeds benefit local charities. The Beaufort Historical Association opens the buildings of the Beaufort Historic Site for current and prospective members to explore the rich cultural heritage of Carteret County.